There was one point, though, when a great many people expressed unhappiness. That would be during the so-called “Main Event,” when Teddy — despite some assistance from wrestler C.M. Punk (video below) — narrowly lost to Thomas Jefferson. Lots of people booed. LOTS of people. I’m not sure when better to break the streak than during a home opener featuring a first-place team with playoff aspirations. The front office evidently doesn’t agree. But somehow I’ve come to agree with Jayson Werth, who spoke out again following the win. Not only is the gimmick tired, but it does celebrate losing to a certain (admittedly inconsequential) degree. I want it to end. Thursday would have been the perfect time. As for speculation that the race went down the left-field line to avoid Werth shenanigans, a team spokesperson told me the race will randomly alternate between the left and right field lines this season, and that Thursday’s finish line had nothing to do with anything that happened last season. So stay on your toes, Mr. Werth. After playing the game of his life in his Stanley Cup playoff debut, Braden Holtby said “Mainly, I wasn’t there for the boys in overtime, and I’ll definitely be better for that.” Sir, the boys weren’t there for you. From Michael Lee: “One prominent agent said . . . there is “no way” Leonsis can bring back Grunfeld” next season. The saddest D.C. sports fan I know, 106.7 The Fan’s Danny Rouhier, was at it again after the Caps lost in overtime. Phase 1 after a DC sports loss: Personal Inventory: what did I do wrong? I am so tired of feeling this way. The Alex Ovechkin collision with Dennis Seidenberg was probably the best part of Game 1. Also, a collision like this would likely cause a normal person to disintegrate. Via RMNB. Reds at Nats at 7 on MASN2. I’ll probably be there. Orioles at Blue Jays at 7 on MASN. Wizards at Knicks at 7:30 on Comcast SportsNet. All TV/Radio listings are here. Nats Enquirer has video of Gio Gonzalez’s first career hit. Russian Machine Never Breaks has video of Alex Ovechkin’s new “Because It’s the Cup” commercial. 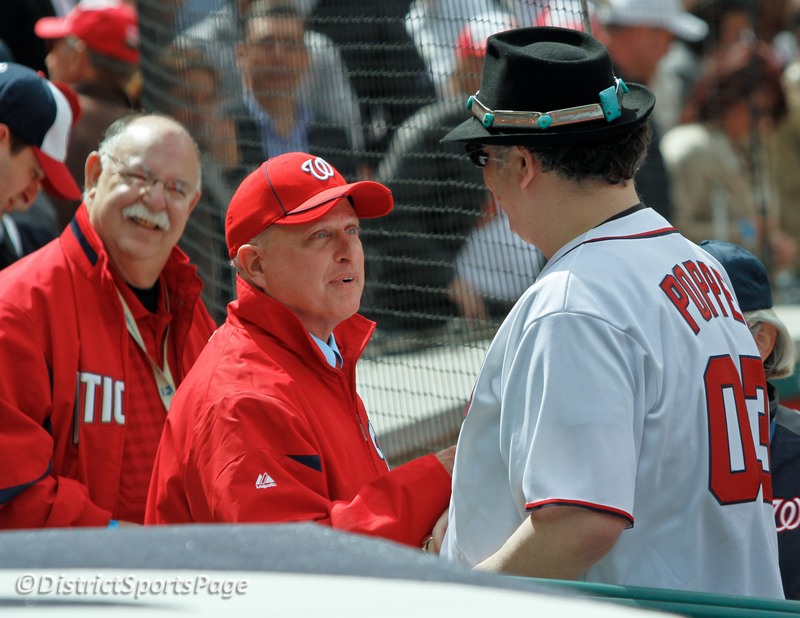 Here’s the dude from Blues Traveler shaking hands with Mark Lerner after playing God Bless America on the harmonica.